Note: This tutorial is done with PHOTOSHOP CS4. If you’re using Elements or a different CS, chances are there could be some nuances. Note that you can do this in just about any graphics program, but the animation process will be different. 1. Grab your image. Really you can use anything you like — even text! 2. Open up the image in Photoshop. That, or FILE –> PLACE it in whatever image you want your glittery picture in. Take a look at this post’s banner, for example. 3. Duplicate the layer of your image twice. Three times, if necessary. Why are we doing this? Because Photoshop animation frames have to be separate layers. Annoying, but, yknow, justified. You’re going to have to do this step now, lest the extremely simple process of glitteratizing things get pretty messy. Right now your layers should look something like this. 4. Select your most recent layer and go to FILTER –> NOISE –> ADD NOISE. (I’m going to resist making a TWEWY pun here.) 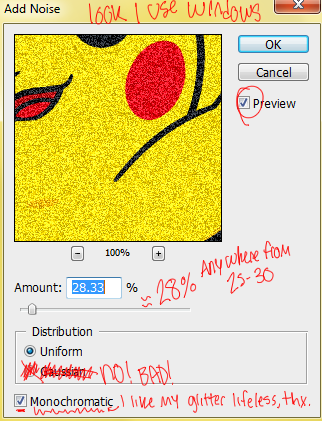 Right now, I’d be selecting “Pikachu copy 2.” If you only want the glitter on a particular part of the image (in the banner, the glitter is only on the yellow part of Pikachu), each time you do this you’re going to have to select that area and THEN add the noise. You may need to rasterize the layer in order to do this. If so, just click OK when the prompt comes up. Check out my professional annotation. 5. Apply these lovely options. Depending on what look you’re going for, you may want to go heavier or lighter on the noise amount. Just remember, the next time we add noise, the amount will go up, so don’t start at 100%, you crazy person you. Always remember to keep the distribution on Uniform and not Gaussian. Why? Because, when using Gaussian, the dots always stay in the same place, even if you change the noise amount. And that’s not animation. that’s just NONSENSICAL TIME-WASTING. Also, keep it on monochromatic, because otherwise it will be rainbow and you’ll be so distracted by all the pretty colors you won’t even finish this tutorial, you’ll just be like OMG COLORS. 6. Click OK, and set that layer to invisible. Just click the little eye icon next to the current layer. Now select the layer underneath it! 7. Repeat the process of adding noise, only with an increased amount. For Pikachu here, we’re going to jack it up to somewhere between 30 and 40 percent. One small caveat: don’t make the amount of noise on any of your frames too drastically different (e.g. one frame has 5% noise and the next has 70%), or the animation will be choppy and it will become obvious that you did this following some tutorial on some stupid blog or something (or NOT following, rather). 8. Repeat steps 6 and 7, only with the third layer~! 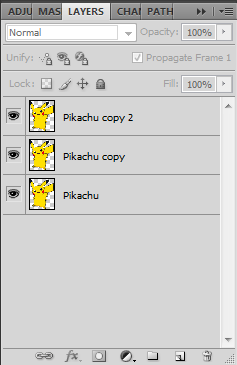 To avoid confusion, right now I would be editing the layer “Pikachu,” while both copy layers are invisible. Again, increase your noise amount, this time to somewhere between 40-50%. 9. Animate! Wave your magic hankie and it spontaneously becomes a .gif. If you are not a wizard, however, you’ll need to head to WINDOW –> ANIMATION. If there isn’t a check mark there, click it, and an animation window should appear, with one frame in it. If you’re in timeline view, click the teeny tiny icon with squares in it, located in the bottom right corner, to switch to frame view. Granted you still have only the bottom layer visible, all you need to do to this first frame is adjust the delay so it’s .1 seconds (or maybe .2, if you swing that way). Otherwise, the animation is going to go rocking fast at 0 delay. If you set it to anything higher (ten second delay is pretty tempting), you’re gonna have a problem as well, because it’ll move at the speed of a tortoise. Now you’re gonna want to create a new frame (unless you don’t want to. In that case, gtfo.) by pressing that little button that looks like a piece of paper next to the garbage can symbol (yknow, because your animations are this close to GARBAGE). In this frame, make the second layer visible again — yep, that’s all it takes to set up a frame. You’re halfway there! Now just repeat that process of creating a new frame, only this time making sure the top layer is the one that’s visible. Clicking through the frames, you should see some slight movement in the noise on your image. Just one more itty-bitty step! Make one last frame, setting the first layer back to invisible so you can see the second one again. This is just to guard against the rocky transition from the third frame (the one with the heaviest noise) to the first (the one with the lightest noise) and make it look like you put more than three frames worth of effort into this. Glitter must be derived from blood, sweat, and tears. If it isn’t already, make sure the looping amount is set to FOREVER, because you want to torment your viewers with eternal sparkles. Unless you, yknow, only want it to loop once, but if that’s the case you’re probably the same guy who only wanted one frame anyway. At this point it might be a good idea to check how this all looks by using the nifty play button underneath your frames (see image above) to test the animation. Hopefully, if my explanation isn’t too crazy you are not a silly sack of fish, this will play out smoothly. 10. Export it as a .gif! Dun dun DAAAHHHHHHH! “But wait!” you think, “There’s no option to save it as a .gif under SAVE AS…” Nope, there isn’t. Looks like we’ll have to use FILE –> SAVE FOR WEB & DEVICES instead. This’ll pull up a biiiiiiig ugly window with options for you to fiddle with. No specifics here, just make sure you’re exporting a .gif, and not a .jpeg or .png. You can change the file type under where it says “Preset,” in the top right corner. You’ll be able to play your animation here also. When you’re done, hit the SAVE button at the bottom! Hooray, a brand new glittery .gif! Now time to email it to all of your friends and see how jelly they get at your MaD pHoToShOp SkIlLz. Or, better yet, link to it in the comments below, because I want to be jelly too. The image in the banner is official art from the Pokemon Dream World (read: NOT MINE). hackers? My last drupal blog at http://itsragtime.wordpress. It’s truly a breath of fresh air the minute you come across somebody on the net that knows what they’re speaking about. Really, it’s positive to at last find somebody writing about this problem in a clear and open way. Many more people have got to view this and learn about your side of the story.. I would really like to see you become more well-known, because you definitely have ideas to share. By the way, is your template custom made or did you acquire it from elsewhere? A look just like your own with a handful of small changes would actually make my website shine. Kindly tell me the place where you found your layout. Right on. I learn something completely new and exciting on websites I come upon on http://itsragtime. It’s never a bad idea to engage the ideas and material of other writers and link to other sites.